Did People Die During Army Operation That Led to Mugabe's Ouster? Opposition politician Job Sikhala (file photo). Opposition MDC legislator Job Sikhala was last week ejected from Parliament in a row with defence minister Oppah Muchinguri over the number of people killed during last year's coup. A military revolt forced then president Robert Mugabe to resign last November, with former deputy Emmerson Mnangagwa returning from brief exile in South Africa to take over power. Mugabe and his allies have insisted that many were killed during the coup. Several former cabinet ministers and senior ruling Zanu PF officials were also escaped into exile, among them Prof Jonathan Moyo, Saviour Kasukuwere and Patrick Zhuwao. Last Wednesday Sikhala asked Muchiguri to clarify the exact number of those killed during what the military described as Operation Restore Legitimacy (ORL). The minister said there were no fatalities and also dismissed the Zengeza West MP's charge that many Zimbabweans were exiled by the coup. "The question asked by Hon. 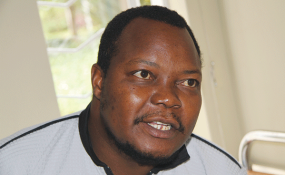 Sikhala does not specify the cause of deaths he is asking about," said Muchinguri. "You are aware that ORL spanned over a period from November 17, 2017 to January 2018. If the Hon. was referring to vendors' ailments; no one was killed during this operation," she said. Regarding those forced into exile, Muchinguri replied: "Government cannot give any statistics on that. "The new government has never ordered anyone to exile. Those that left the country did so willingly and I cannot therefore give any statistics. "We cannot speak on behalf of people who try evade the law and label them as 'exiled by government'. "Government is not a threat to anyone who goes into self-exile." She added; "A number of those who went in self-exile have since returned. "We have people like former Vice President Phelekezela Mphoko, Saviour Kasukuwere, Mafios Dickson and Walter Mzembi who are back home." Sikhala tried in vain to raise a supplementary question but was asked to take his seat. He then and he scolded one of Zanu PF legislators calling him a "baboon". Deputy Speaker Tsitsi Gezi ordered him to apologise but Sikhala refused insisting that he had been attacked first and was thus only "applying the principle of compensation". The deputy speaker then ordered him to leave the House. "Hon. Member, you are using unparliamentary language, so may you please go out," Gezi told Sikhala who tried in vain to negotiate with her as he left the House. The other MDC legislators followed Sikhala out in protest, leaving the Zanu PF members to continue with the Question and Answer session.